Without going into details that are unnecessary to share, let's just say that things have been tough behind the scenes the last couple of months. Beyond the normal day-to-day stresses has been a situation that sadly, has resulted in a farewell to one of my closest workmates, someone I have teamed with over the course of many years, a mentor of sorts, and a dear friend. One of the countless things I admire about him is his artistry. He is a graphic artist, as well as a poet and just generally a gifted wordsmith. It was his love of art that spoke to me and provided the vision for this quilt for him. I began with shapes... improv shapes that I am so drawn to - stripes and crosses and crosshatches - encircling them all to create some structure, an element so key as an artist creates. I found Latifah Saafir's The Clammy 12" template indispensable once again in making the circle blocks. Though I fully intended to 'fill' every circle with the shapes, it wasn't long before I realized a little went a long way. As a nod to different forms of art, I chose a variety of fabrics with different textures.... quilter's cotton, Essex yarn-dyed linen-cotton blends, a Moda cross weave, and a lone Indah Batik. 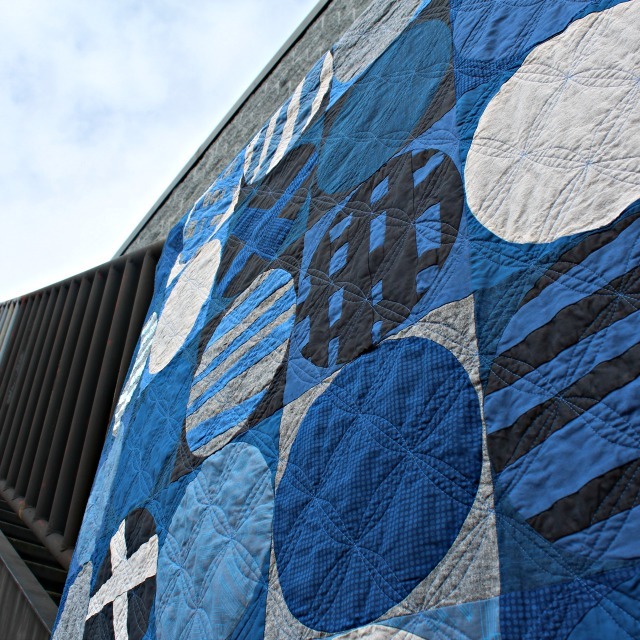 For quilting, Aurifil 50wt #2730 (Delft Blue) was an obvious pick, and I was more convinced the farther I quilted. Guided by Jacquie Gering's Walk, I chose a diagonal orange peel design, which began with a hera-marked 4" grid. After quilting that, I went back to quilt the curves unmarked, which meant the result was a tad organic, but suited me and the quilt just fine. With a binding in Kona Prussian, the quilt finished at 60" x 72". And so this quilt came together rather quickly so I can send my friend off in the best way I know how. Because at times like this.... there are no words. This is a lovely piece that looks like it could reveal new things to the viewer many times over. I think difficult partings are times when gestures like this are especially meaningful, and from one artist to another, it's perfect. Perfectly said, Robby. Thinking of you Debbie. There are definitely occasions when quilts can say more from your heart than any words ever could. I am sure your friend will know that. 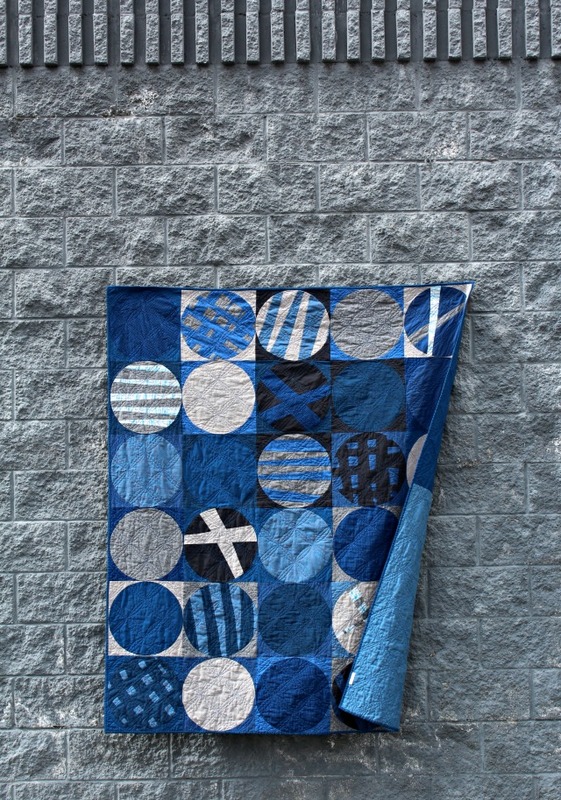 What a fabulous quilt---so graphic and exciting!! This might be my new favorite! I know he will cherish it! This is a quilt that speaks to me, obviously you made it with your heart. Its subtle and deep colors are moving and this quilting is one of my faves -already tested and approved. Incredible photos too, your artist friend can be proud of you. 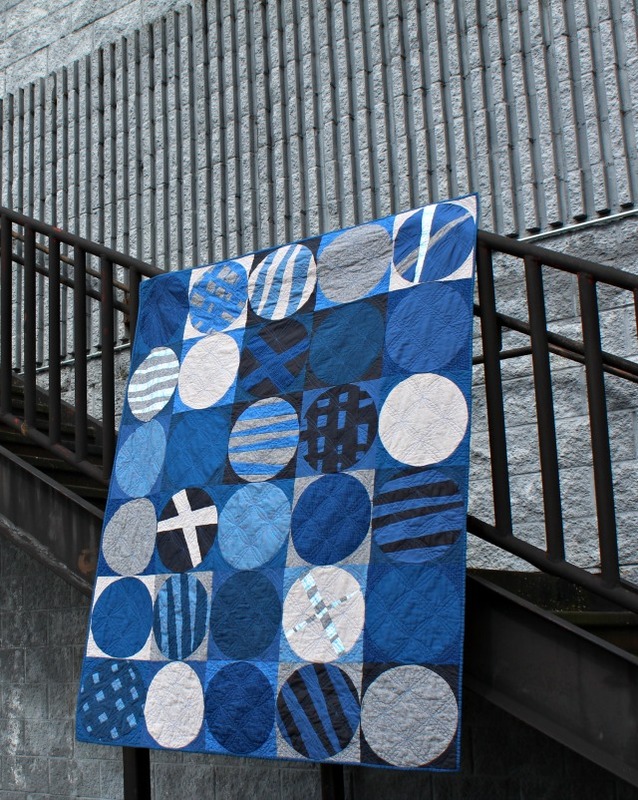 I agree with those who love this quilt as a new favorite...color is so vbrant..quilting is exciting to the eye! Your composition energetic and lively. Your friend will be dazzled by it and sigh with gratitude that he is the chosen recipient! The quilt and quilting are great! Impressive the improv circles. And thanks for the detailed quilting shots. I love the orange peel design but have always been afraid to try it out because of the "wonkyness" of first things but as you said, your organic version just fits really well. Wow ! It's my new favourite Debbie ! I love the design and colours. You always find the right spot for your outside photo shoot ! This was a beautifully written post and also a beautiful gesture. As Yvonne said above, quilts say more than words can, often. I'm sure he will treasure it forever. Also, your quilting looks fabulous - was it hard to see your hera marked lines on so much dark fabric? This piece is quite engaging. Thanks for sharing it. 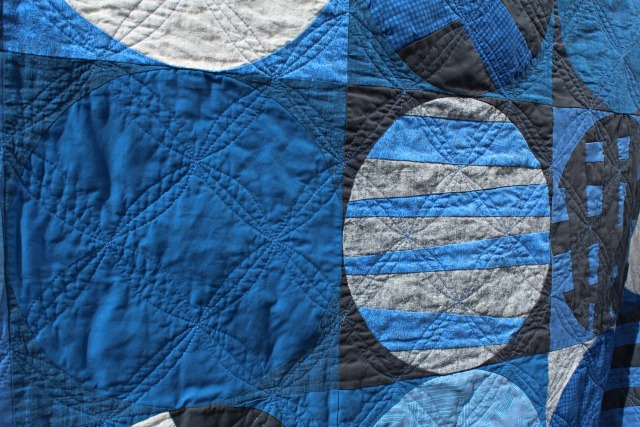 I feel badly asking about the quilt but are the circles appliqued on? Inset? And *hugs*! What a great gift!! It is a masterpiece!! Always best to say a farewell by sharing a piece of yourself for the journey. With this quilt, given to your friend, you have. Wonderful quilt and wonderful post. Thank you. Beautiful! I am totally captivated by this one! We have a Latifah class coming up and if this is part of the Clammy...I'm all in! The fabrics, color and sentiment is inspiring! Just beautiful! A wonderful treasure for your friend. I'm sorry you are losing a colleague and a friend. I hope you will be able to stay close outside of work. The quilt is lovely and as always makes the best gift. Wow, you have once again excelled yourself with this quilt! The quilting is also so very beautiful. A very thoughtful gift, even though it's a farewell gift. what an amazing quilt! I love the design and the colours. Sorry to hear about a bad situation. Your quilt is so touching. I love looking at it.